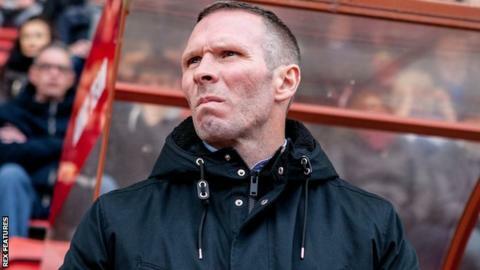 Oxford United manager Michael Appleton is in talks about a new long-term deal with the League Two club. The 40-year-old is the current bookmakers' favourite for the vacant Bristol City job following the sacking of Steve Cotterill on Thursday. "I'm absolutely delighted here. The way it is at the minute, I'm in the middle of discussing a new long-term contract with the club," he told BBC Oxford. Former U's CEO Mark Ashton was appointed chief operating officer at Championship side Bristol City on Saturday, having left his role at the Kassam Stadium last month. Appleton has managed five clubs in less than five years and in January 2013 left Blackpool for Blackburn after just 65 days in charge. "It's difficult to comment on rumours and speculation and that's exactly what it is," added Oxford chairman Darryl Eales. "Mark emailed me just out of courtesy to say that he'd been appointed at Bristol City, but I would be utterly astonished if there's even any conversation going on between them and Michael Appleton." Oxford, who remained third in League Two after Sunday's 2-1 defeat by Bristol Rovers, have also had to deal with rumours about the future of midfielder Kemar Roofe. "I have had no phone calls or expressions of interest in Kemar Roofe or John Lundstram," added Eales. "As far as I'm concerned no player is for sale."